Eternity is a wall mounted sculpture made by American artists Alicia Eggert and Mike Fleming, consisting of 30 electric clocks. 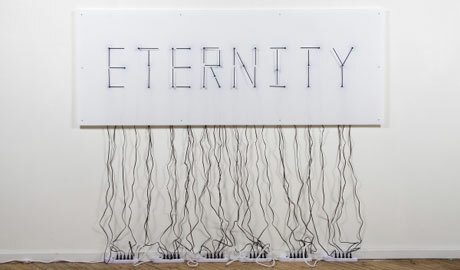 During installation, the black hour and minute hands of the clocks are aligned to spell the word ‘eternity’, and the clocks are plugged in to a series of power strips. 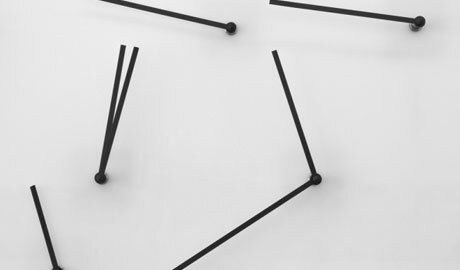 The hands begin to move as soon as the switch on the last power strip is flipped, and the word almost immediately becomes a jumble of moving black lines. Eternity does not reappear until the hour hands return to their original positions twelve hours later.